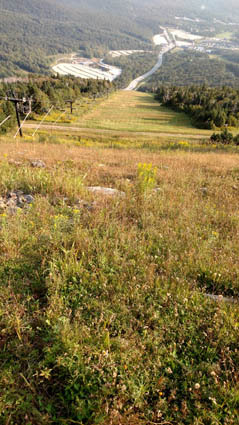 Looking down from the top of Superstar, Crain snapped this photo. It was the middle of his 40-pound weighted-vest hike up and down that trail. At about mile 15, I crossed Route 4 from the Sherborne Pass lot to head up Deer’s Leap. Once on the trail, I squatted down to stretch my glute, quad, and sacral muscles. When I stood back up, I passed out. When I started my run early last week, it started out pretty well. I felt good enough that coming up the Sherburne Pass trail on my way to Killington Peak, I stopped off at Pico Peak via the Hershey Highway. It was cool and foggy, and a delightful 60-ish degrees. I continued my run up Killington Peak (very windy at the top), and then on the way back, I went up Pico peak again. No turned ankles, no face flops, no heat stroke. No nothing. I felt great. It was a glorious morning for a run, and run I did, well. At about mile 13 the fog broke, and the temperature pretty rapidly climbed from the mid-60s to the high 70s or maybe 80 degrees. I started to feel it a little bit. Then I crossed the road. After a moment’s hesitation, I continued on, but proved to be out of water about 200 feet in, so I took a hint and called it quits for the day. Still, it was a great run: four hours, 4,500 vertical feet, 15.17 miles. And I felt strong for the whole thing. I followed that up the next day with a 7 mile walk with about 1,000-foot vertical, and the day after that, I hiked up Superstar wearing a 40-pound vest, for 1.66 miles and 1,170-foot vertical. Going up wasn’t nearly the challenge I thought it would be, it was going down that sucked. Eccentric muscle contractions on a relatively smooth descent surface (not smooth mind you, but no steps) is a difficult thing. Still, though if I had brought water I would have done it twice. I was expecting to be thoroughly finished by the end of the first one. A few slips and falls aside, it wasn’t bad at all. The next day I cycled East Mountain Road (which I still hate, but is getting pretty easy at this point), and the next day I did a quick four miler, up the Sherburne Pass trail to the Pico overlook and back, for about 1,250-foot vertical, with my average pace in the mid-13s per mile, which is pretty good considering what a slog the uphill is. I was almost all the way down, ripping along quickly, patting myself on the back like a politician slapping old boys on the back in a meeting for illegal funding, when I tripped hard. It is one thing to face flop on a relatively flat piece of trail, and it is another entirely to face flop on a piece of rock pitched at 30 degrees. Having, as you well know, much experience with floppitude, I hit the ground in a roll, and popped up running, a little dirtier, and with a charliehorse in my left quad. In short order, thereafter, I rolled my left ankle, and then, while I was still grumbling, rolled it again. While I was grumbling about that I rolled my right! It was a very eventful tenth of a mile, and I will be glad not to repeat it! The ankle rolling and tripping is very specific behavior. It only happens on downhills, when I run with my toes pointed (trying to land the ball of the foot first in the stride); the rolling only happens when one foot is planted and the other is stepping down (if both feet are in the air I am fine), and it only happens if I become distracted and start to think about other things while I am running. Concentration is an issue for me, and a major one, but being on a course unfamiliar to me will take care of the problem, if I can keep myself intact long enough to get there! I finished out my week with a 4.5 mile 500-foot vertical foot walk. Throughout the week I tried to do as many pull-ups, pushups, and burpees as possible, and did significant ab/core work daily. Distance walking on my off days seems to be a great way to keep things going, and is making me considerably stronger. Also it works the kinks out of the poor old tired muscles. As I write this, I am taking a REAL rest day, doing nothing but my warmups and some ab work, to keep my back from turning into a Cheese Doodle. Oddly, I’ve been doing so much pull, push, and leg work, that my pull-up set numbers are actually going down, which was puzzling. The other day, my mom measured me for a sweater she wanted to make me (yep, I’m a million years old, and my mom still makes me sweaters, I love it), and my chest has grown three and a half inches since the last time I was measured for a suit. The reason my sets are decreasing instead of increasing is that I am gaining muscle weight, and pretty rapidly. This coming week will be the same basic schedule with more miles. Good times! I am getting very excited for the Spartan Ultra. Some long-time Spartans have given me some tips about how to do certain obstacles and carries, and aside from the fact that I am scared to death, I am super psyched. No one has ever died doing this, right? Right? As for Pip the Impaler (my rescued guinea pig), we are going through some good times. He hasn’t drawn blood, and I didn’t even injure him clipping his nails last night, even though he made it damned near impossible. He is starting to let me pet him without food. Sometimes he starts to bite and thinks better of it. Perhaps he’s learning? The other day he sat with me for quite a while, and just licked my hand…behavior that I have never seen from a guinea pig. He has also started to do one of the things that I truly loved about my last guinea pig (the sainted Stinky Pete, who even now, I am sure, is sitting on a satin pillow on the lap of St. Peter), which is a move in which he would stretch, yawn, and purr, kind of all at the same time. Pip is starting to do this while being touched, even though his instinct is clearly to vacate the premises out of fear. His limbic system is starting to adapt to his surroundings, and he is starting to forget the trauma of his early life. I hope.